Full-size trucks have never been more advanced. Their same towing and hauling capabilities carry over, of course, but almost every modern option comes loaded with safety features, towing aids – the whole lot. 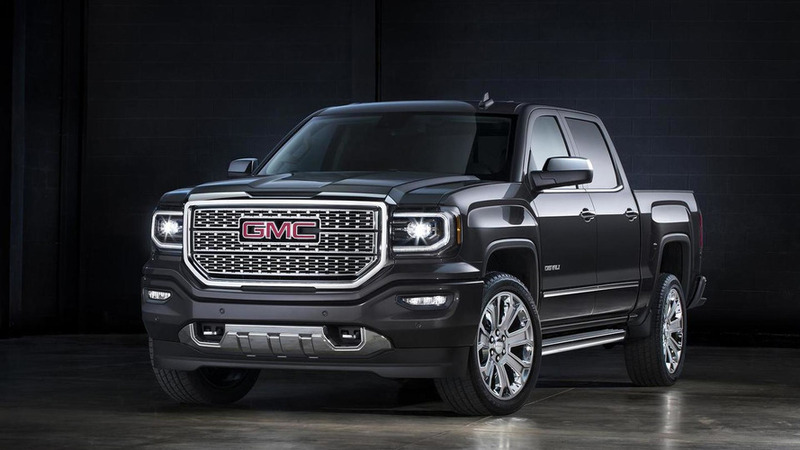 But while the Ford F-150 and Ram 1500 are both impressive relative to the rest of the range, the new GMC Sierra Denali is from another planet. Visually, the Sierra Denali stands out. It has a lot of chrome – more chrome than it knows what to do with, honestly. The grille, fog light surrounds, wheels, window surrounds, door handles, side mirrors, badges, and grille tips… all chrome. Perched atop a seaside cliff in Newfoundland where we spent three days, the garish truck was a sharp contrast to the surrounding natural beauty. Ignore the shiny stuff, though, and the Sierra has really attractive bones. The off-road AT4 package was proof of that – it looked more at home in the Canadian wilderness. 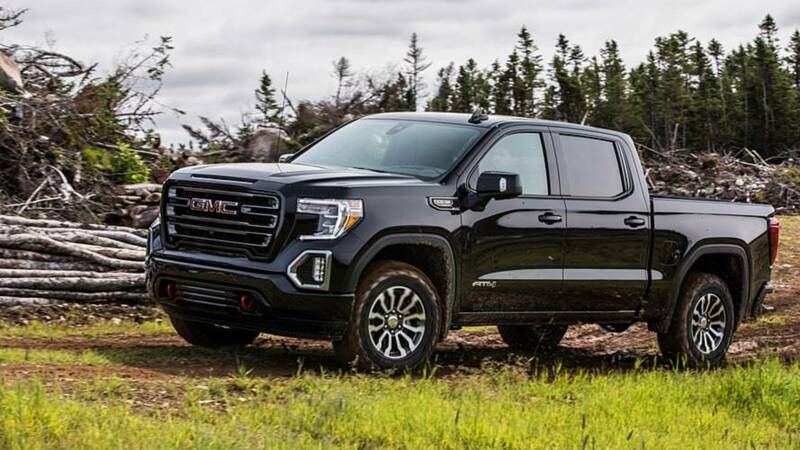 It ditches all the tacky bright finishes found on the Denali in place of a body-colored surround on the grille and black chrome inserts on the grille, bumper, and wheels, with black accents elsewhere. It also gets a two-inch lift and big knobby tires, which makes any truck look cool. Not only is the Multipro Tailgate addicting to play with, but it reinvents the concept of loading a truck bed entirely. Other trucks, like the Ford F-150, have optional steps – but none are as integrated as this. With the touch of a button, the tailgate folds down into a step. It made loading things like cod traps and hay barrels extremely easy. We were in Newfoundland, after all. For longer materials like wood planks, the primary gate load stop added a few extra inches to the bed. And with the added functionality of a foot-activated running sideboard and a rear corner step (standard on all trim levels), it was easy to tie down the materials at both ends. 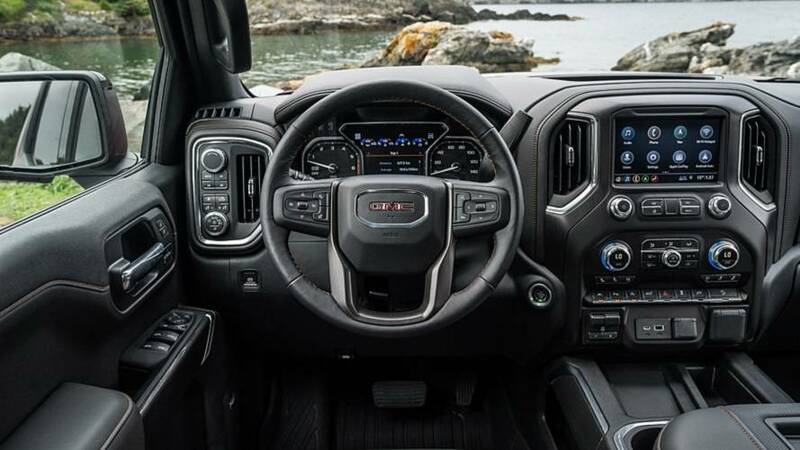 GMC integrated Dynamic Fuel Management seamlessly. The Sierra Denali comes with two engines: either a 5.3-liter V8 or a 6.2-liter V8. But these are no ancient blocks. Both get the same Dynamic Fuel Management system as the Chevy Silverado that deactivates and reactivates cylinders automatically, depending on drive conditions. Driving downhill – with a special read-out box installed by engineers – the truck was running on one cylinder at one point. Doing 50 miles per hour on a two-lane road, just four cylinders were active. Foot down, all eight cylinders come to life. But you'd never guess the engine was working that hard. Like the folks at Chevy, GMC integrated Dynamic Fuel Management seamlessly. It doesn't tell you when or how it's working, it just does. I wasn't able to feel it, no matter how aggressively I pressed and depressed the gas pedal. 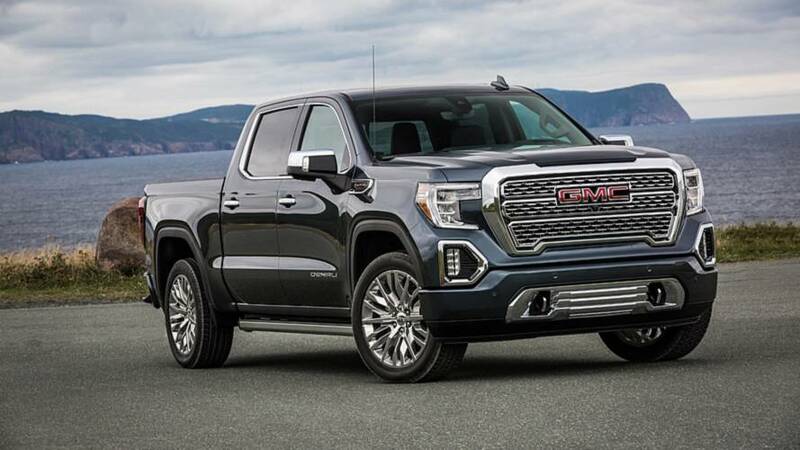 The Sierra drives like any other V8-powered Ram or Ford, and the Dynamic Fuel Management helps yield a return of 15 miles per gallon in the city, and 20 highway on the 6.2-liter V8. The smaller 5.3-liter engine gets up to 17 city and 23 highway with two-wheel drive. The larger V8 has more power, though. It produces a hearty 420 horses and 460 pound-feet of torque (vs. 355 hp and 383 lb-ft on the 5.3-liter). With all that oomph, the Sierra has a ton of grunt. It roars from a standstill, and the 10-speed automatic – jointly developed by GM and Ford – immediately and thoughtlessly downshifts when you really get on it. For the most part, the Sierra is a solid performer. Four driving modes – Tour, Sport, Off-Road, and Tow/Haul – give way to different personalities. I spent most of the time in Sport mode; it tightens up the steering, giving it a near perfect weight balance, and improves throttle response. Tour mode was a bit too soft for my liking and Off-Road and Tow/Haul – though we didn't spend a lot of time in either setting – both have a lot of functionality. Even in the sportiest drive setting, though, the Sierra Denali is whisper quiet. The cabin blurs the lines between work truck and full-blown luxury vehicle – it's posh by any definition. 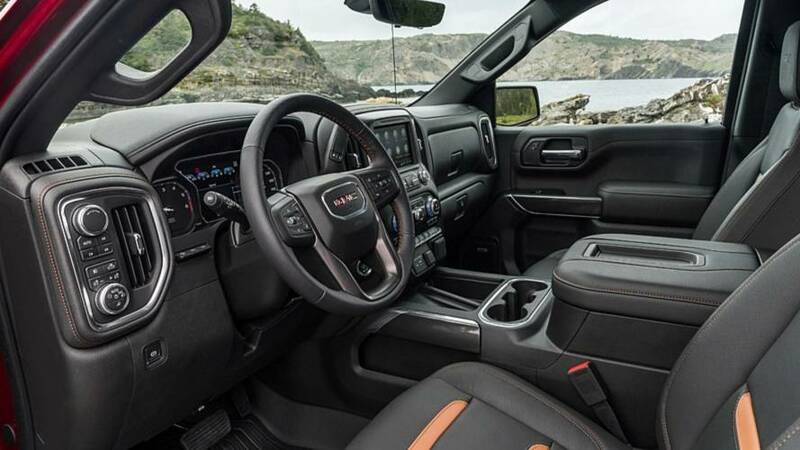 The leather seats are soft and super comfortable, but GMC designers promise they'll stand up to years of blue jean wear, too. 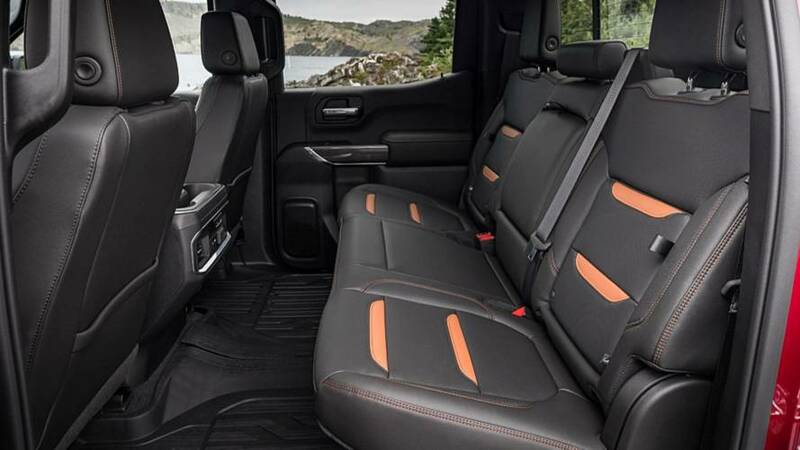 Genuine wood accents and silver finishes add some much-needed definition to the cabin, and like most trucks in this segment, the Sierra has an impressive amount of legroom. The 44.5 inches up front are best in class, and the 43.4 inches in the rear provide tons of room. The Sierra has an impressive amount of legroom. If I had one complaint, the Sierra's cabin still has too much Silverado in its DNA. That's not as much a knock against the Sierra as it is high praise of the Silverado; a lot of the same fit, finish, and capabilities of Chevy's truck carry over onto the Sierra Denali. Most of the same tech, as well, comes on both trucks. Where the Sierra separates itself, though, is in the packaging. Again, lots here is available on the Silverado, but the Sierra offers more tech on almost every trim. And it's all beautifully integrated. The huge three-by-seven-inch head-up display has 11 functional features, there's Wi-Fi, and the second-gen rear-view camera mirror can zoom and adjust brightness for an even better experience. The Advanced Trailering Package and Trailering Camera Package will be another huge selling point. It has enough functionality to make novice towers look like experts. The eight-inch infotainment screen serves as the hub for all your towing needs. Multiple cameras give you a view of what you're doing at all times. A full lighting test – accessible either on the eight-inch screen or via GMC's app – alleviates the frustration of towing alone. And the addition of a rear hitch camera – accessible while driving – assures you won't forget to tie it down. But with all that luxury and tech, towing takes a back seat. 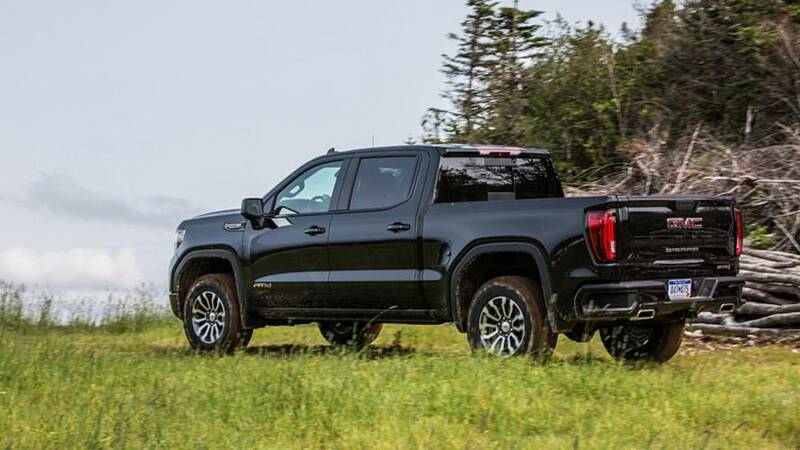 With four-wheel drive and the 6.2-liter V8, the Sierra Denali can only tow 9,300. That number jumps to 9,600 with the 5.3-liter V8 and two-wheel drive, and up to 12,200 in the non-Denali Crew Cab with four-wheel drive. None of those numbers are best in class, but it's all kind of silly chest-puffing anyway. We were able to tow four ATVs easily with the AT4 model, for instance. There's a lot to like about the new GMC Sierra Denali – too much to appreciate in just a few hours with it. Bottom line: the Sierra Denali is impressive. It mixes Tony Stark tech with two impressively engineered V8s, and looks great for the most part. If you can swallow the $62,950 asking price (as tested), it’s one of the most advanced options in an increasingly competitive set.